Looking for the best form builder plugins for WordPress? Want to create powerful contact forms to collect client inquiries or order forms to accept orders and payments from customers around the globe? If so, you need a premium-quality form builder plugin in the site. It allows you to create and design forms as you like and use them for any purpose including collecting user feedback, product inquiries, surveys, polls, user registration, etc. WPForms and Gravity Forms are the most popular plugins that give you full control over the form development. They are easy to use, customizable, and great in quality. Today we’re going to compare both plugins to choose a winner. WPForms is an intelligent form builder plugin for WordPress. It is easy to use and comes with a drag and drop feature to design forms as you want. The forms are responsive, mobile-friendly and highly secured. From collecting leads to orders, user registrations to email marketing, Surveys to polls, it fits all your needs. It is used by many thousands of WordPress site owners to create interactive surveys in beautiful formats to engage their fans. WPForms has a huge collection of stunning built-in form templates to save your time in creating forms. Its smart captcha and honeypot can prevent spam form submissions automatically. You can further extend the prevention by adding custom questions and Match captcha in the forms. WPForms allows you to uncover new possibilities using premium add-ons like PayPal, Stripe, MailChimp, Constant Contact, Aweber, Get Response, Zapier and many others. 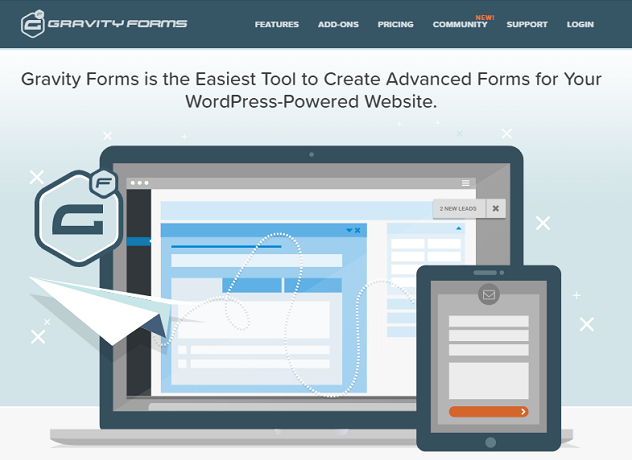 Gravity Forms is another advanced form builder plugin for WordPress. It is simple to handle and lets you create advanced forms in a few minutes. Being premium, the plugin is packed with unlimited features and powerful tools to configure your form and grow the business. It is responsive, mobile-optimized, and connects you to the clients closer. A form plugin should be able to handle any of your needs without seeking the coding knowledge. Gravity Forms is such a plugin that will work even beyond your expectations. It opens endless possibilities for you with premium add-ons like Gravity+, GravityPDF, PayPal, Stripe, MailChimp, Dropbox, Slack, etc. WPForms has different types of plans for individuals, businesses, developers, and agencies. 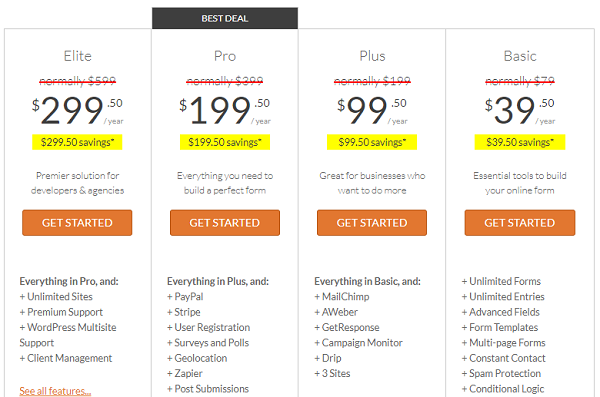 The basic plan starts from $39.50/year (limited time deal) with unlimited forms, templates, and other essential features. The basic plan users can use the form in one site and they will get one year of support, downloads, and updates for the product. If you want to use WPForms in multiple sites, go with either the Plus or Pro plan. The Plus plan costs $99.50/year and lets you use forms in 3 sites whereas you can use them in up to 20 sites in the Pro plan which is chargeable $199.50 per year. On the other hand, Gravity Forms costs $59/year for a basic license. It supports one website with unlimited forms and basic add-ons. If you want to use Gravity Forms in multiple websites or want to unlock other add-ons, upgrade to the advanced licenses. The Pro plan costs $159 annually and Elite plan $259 for the same period. The Pro license is best for small-scale businesses and they can use the plugin for up to 3 sites. The Elite license fits large-scale businesses and agencies. It supports unlimited websites and offers more than 40 add-ons to utilize opportunities and grow the business. While considering features and pricing, WPForms is the best form builder plugin for WordPress. It has several unique features over Gravity Forms and won’t let you lose a lead maximum using form abandonment and offline form add-ons. 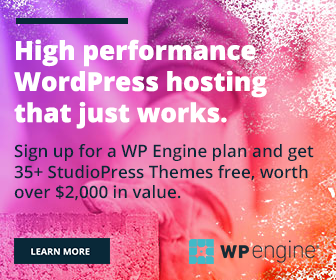 WPForms is affordable for small websites and blogs that costs $39.50 per year for a single site and $99.50 for multi-sites. 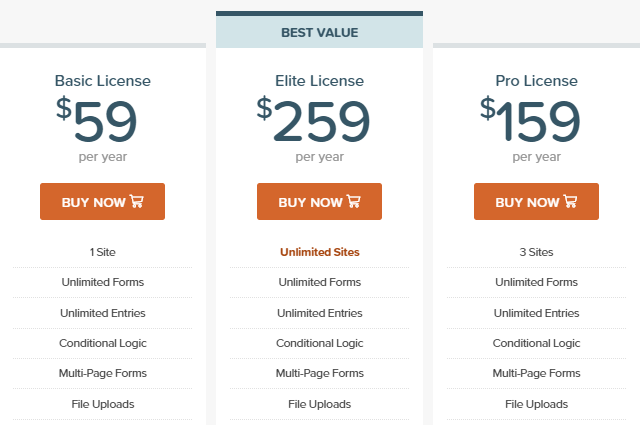 But you need to pay $59 for Gravity Forms for a single site license and $159 for multi-sites annually. Custom captcha, built-in templates, and custom CSS are some other reasons why people prefer WPForms to others.